What is Job Verification Form? There are several types of verification forms that are intended to confirm your specific job position. Such forms are used to counter check if you are a job holder or if you are willing it to be or whatever the nature of your job is. A job verification form is one of the best ways to avoid frauds related to the issues about fraud jobs when someone is hesitant or hiding his/her current job status. 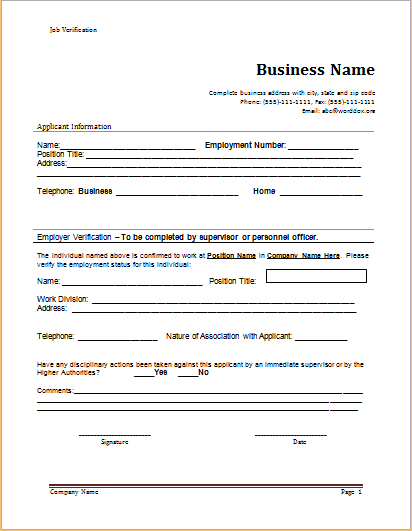 So, this form is utilized to ensure you are being employed and to which specific organization. When you need to fill the job verification form, you might have to fill out certain details as mentioned here. Firstly, you must mention your name if you are employed somewhere and state the name of your employer as well. It is important for you to describe your job nature as well as inform the people about the specific organization and mention your job timings. Next thing that is necessary to be added in the form is the details about your salary and the job contract. You might also have to put your contact details including the phone numbers, fax numbers, and email addresses. When Do You Need the Form? You need a job verification form when you must give proof to some organization about your certain job position. It can also be required by the court of law when some tax has been imposed on you and they require your financial details. Nonetheless, this sample form serves as an important document.